Set of 3 - 8.3" x 11.8" Medium Grill Bags per package. Easy to fill with your favorite ingredients. Locks in moisture and flavor for great tasting, juicy results. A unique solution for healthy and convenient cooking and storage. Innovative anti-leaking seal technology enhances the strength of seams and prevents leaks. Uniquely designed to maintain a seal at low temperatures, & vent excess steam during cooking. 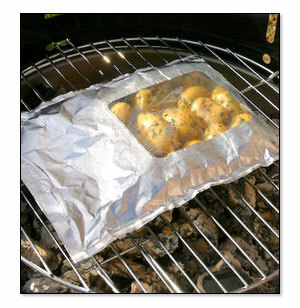 Easily peel away window & serve directly from Qbag. Self-venting window constructed of FDA approved food grade polyester film. Grill Bags are 100% recyclable.